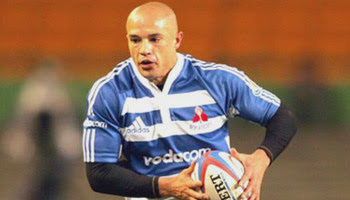 Conrad Jantjies played for the Lions in the past. In fact, he's a Joburg boy through and through. The talented fullback made the move down to the Cape not too long ago though, and is now plying his trade for Western Province in the Currie Cup. At Newlands last weekend he put in this impressive hit on the much larger figure of Lions Number Eight Jacques Cronje. Blind siding him and knocking him back, and even drawing a little blood, he then drove Cronje into touch. A valuable hit in the scheme of things, as this was a very open game with some great running rugby. Once again it goes to show that a little guy can take down a big man with ease, no matter how small you are. Even though it was maybe a little high and with the shoulder. Does any fello know how one goes about buying a nice Western Province rugby shirt, as modelled by Mr Jantjies, when residing in the shires of England? Funkin RL cheap shot if you ask me tho.